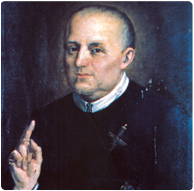 St. Clement Hofbauer was bor n in Tasswitz, Moravia (now the Czech Republic), on December 26, 1751. In his youth, after the death of his father, he worked as an apprentice baker. Having become a servant in the Norbertine Abbey at Klosterbruck, he was able to follow the call to the priesthood by completing his secondary schooling and then his catechetical, philosophical, and theological studies in Vienna. During this time he made yearly pilgrimages to Rome, where he met the Redemptorists. On October 24, 1784, with his friend Thaddeus Hübl, Clement entered the Redemptorist Congregation. Both men professed religious vows on March 19, 1785, and were ordained priests on March 29. As vicar general of the Congregation north of the Alps, Clement founded the first house of the Redemptorists in Warsaw, Poland. Other houses were established in Poland, Prussia, Germany, Switzerland, and Romania. He lived in Warsaw from 1787 to 1808, and with the collaboration of lay people of various nationalities, he developed a very fruitful apostolate, promoting good works and strengthening the piety of the faithful. He died in Vienna on March 15, 1820 and was canonized by St. Pius X on May 20, 1909. He is co-patron of both Vienna and Warsaw. The shrine of St. Clement Hofbauer is in the church Maria am Gestade in Vienna. Gracious God, our God of care and compassion for humanity, you filled St. Clement Mary Hofbauer with a special zeal for the well-being of people, especially those who are poor or troubled in spirit. In St. Clement you revealed the richness of your loving kindness and mercy. Through his intercession, help us to remain true to the Catholic faith, which he so nobly taught. Let us walk in the path that St. Clement marked out by his own life. Hear and answer us, God, through Christ our Lord. Amen.